The ALS billet stock is an important accessory for any 50BMG AR-15 conversion. It fits all Mil-Spec AR-15 lowers. The ALS billet stock is CNC machined from high quality 6061 aluminum and it is matte black anodized. The ALS billet stock features a synthetic foam cheek rest and premium Pachmayr Decelerator pad to absorb recoil. 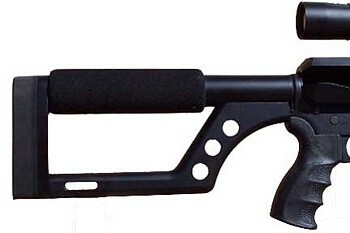 The ALS billet stock features a length of pull of 14 ½” adding 1” total length to a standard A2 stock. This stock is perfect for your 50 BMG conversion or AR-15 rifles such as the .308, .243, .50 Beowulf, and others.